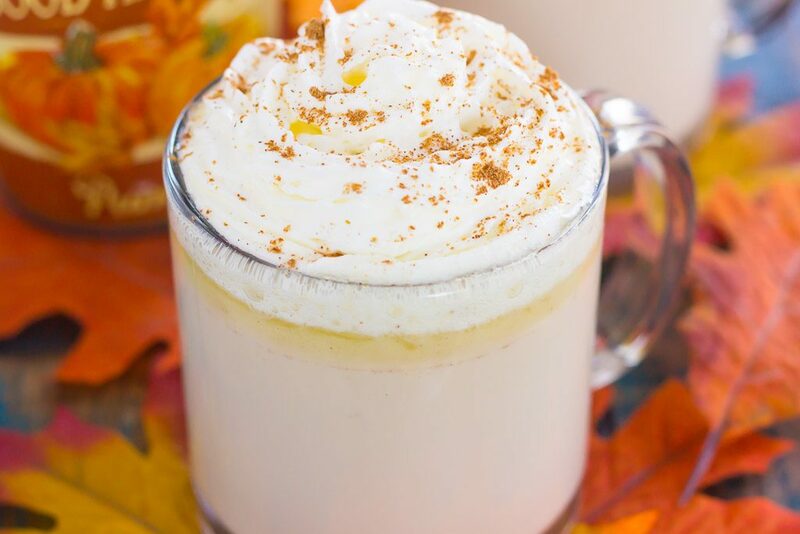 This Slow Cooker Pumpkin Caramel White Hot Chocolate is a deliciously sweet and creamy drink that’s bursting with fall flavors. It’s perfect to enjoy on a chilly evening and is so easy to make! Keep your slow cooker on warm to impress those party guests! There’s just something about hot chocolate that makes everything warm and cozy. I’m the type of person that drinks hot chocolate (and coffee, tea, soup, etc) when it’s eleventy billion degrees out. I love holding a hot mug of something in my hands and sipping on it. It’s soothing, relaxing, and warms me up! And since I’m usually cold, that’s always a good thing. But, when the weather gets cooler, you can be sure that my consumption of hot liquids nearly doubles. From this Salted Caramel Latte in the mornings, to Peanut Butter Cup Hot Chocolate and Spiced Cherry Cider in the afternoon and evenings, I’m always on the hunt for a sweet and satisfying drink. So, I guess it’s no surprise that I made hot chocolate! After all, what’s better than a steaming mug of hot chocolate, topped with a little whipped cream? But, this is my first time using my slow cooker (the best appliance ever!) to make hot chocolate, and I have to say that I’m hooked. It’s the type of drink that you can “set and forget” and go about your day. And with flavors like pumpkin, white chocolate, and caramel, how could you go wrong? If you’ve never made hot chocolate in the slow cooker before, now is the time to start. And if you’re hosting a party or get-together over the holidays (or any time! 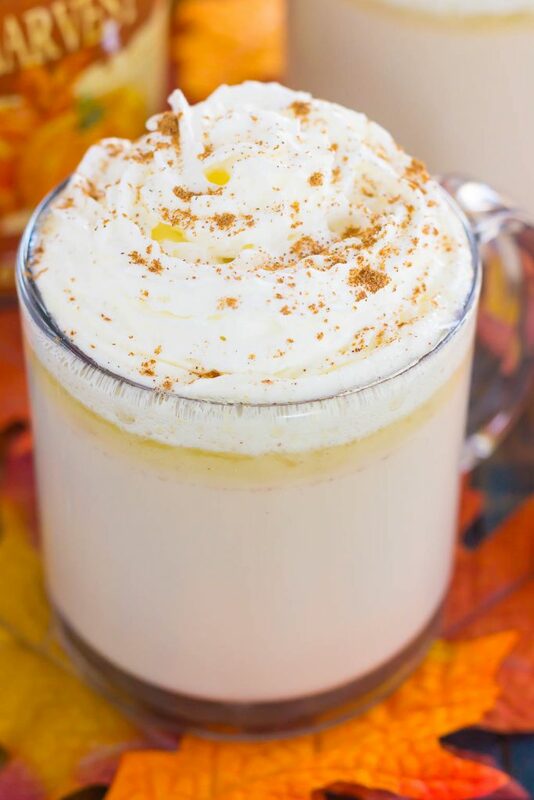 ), this Slow Cooker Pumpkin Caramel White Hot Chocolate is the best drink to keep your guests warm. With smooth flavors like white chocolate, creamy caramel and sweet pumpkin, this hot chocolate is rich and decadent. And since you can throw everything together and let your slow cooker do its thing, it makes this drink even better. 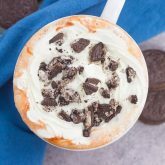 While this slow cooker hot chocolate does make it a lot, you can refrigerate it for up to one week and enjoy a mug whenever you want. There’s nothing better than a hot mug of this Slow Cooker Pumpkin Caramel White Hot Chocolate on a cold morning or evening! 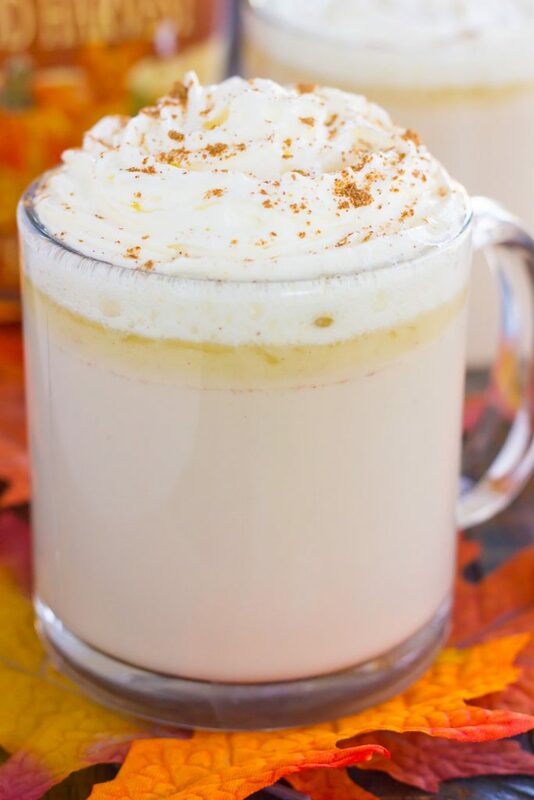 Subscribe to my YouTube Channel to see how easy this Slow Cooker Pumpkin Caramel White Hot Chocolate is to make! Looking for more drink recipes? I’ve got you covered! 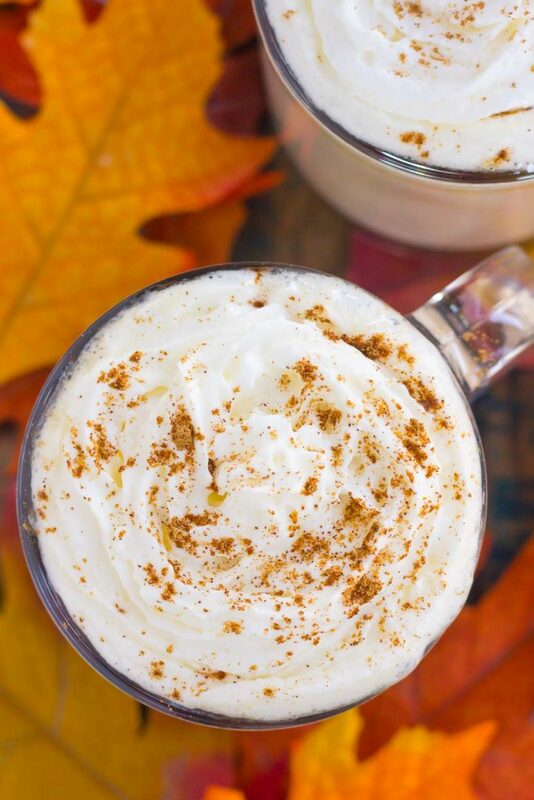 This Slow Cooker Pumpkin Caramel White Hot Chocolate is a deliciously sweet and creamy drink that's bursting with fall flavors. 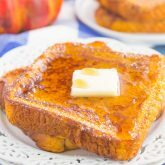 It's perfect to enjoy on a chilly evening and is so easy to make! Keep your slow cooker on warm to impress those party guests! Add milk, white chocolate wafers, caramel bits, coffee creamer, and pumpkin pie spice to a slow cooker. Cover and cook on low for 2-2 1/2 hours. Stir and make sure the white chocolate and caramel bits are melted. If not, replace cover and continue to cook on low until melted. Pour into mugs and serve with whipped cream, if desired. Thank you, Jess! Using your slow cooker for hot chocolate is the best! Your are 100% RIGHT! I love hot chocolate season - and how have I never thought to use my slow cooker, which is of course perfect! I think I need to inaugurate it with this Halloween-perfect version. Happy Halloween, Gayle! Thanks for the sweet comment, Kate! Happy Halloween to you, too! Thanks, Megan! This combo really is SO good! You are so right! When the weather gets colder, my consumption of hot beverages go up A LOT! (well, I definitely have my coffee every day, no matter is it's hot or not, lol ). This hot chocolate looks so good and you did a great job on your video, as usual :) We are having a little get together at our house in December and this would be perfect. I'd double the batch and way to go. Bet this would be awesome spiked for the holidays. Pinned, of course. Have a wonderful week and Happy Halloween :) !! Thank you, Dawn! I have to have coffee every day too, but I like to spice up my afternoons and evenings with something else. Hope you have a wonderful Halloween, friend! Yay for cold fall weather and steamy hot drinks! The flavors in your hot chocolate sound perfect. I'm definitely keeping this in mind for my next party, love that it is made in the slow cooker. This white hot chocolate sounds amazing! It would be perfect to sip on out on the porch while handing out Halloween candy! YES! I love your thinking, Rachelle! Thanks for the kind words! There is something about hot chocolate, and I love making it in the slow cooker! My kids can never get enough, so it's nice making a big batch to have when it's cold out and it's perfect for holidays. I love these flavors Gayle -- the white chocolate with pumpkin and caramel sounds amazing! Thank you, Marcie! I'm hooked on slow cooker hot chocolate! Doubling is pretty much needed for hot chocolate, am I right? :) Thank you for the sweet comment, friend! Happy Halloween to you! I love doing hot drinks in the slow cooker! So perfect for a party :) I have been just WAITING for a cold snowy day to drink hot chocolate by the fire, but my husband is not so enthused. Lol. Hopefully soon! I need to pull my slow cooker out, STAT! I love the caramel bits in this! 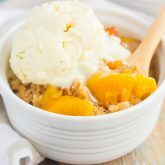 Such a creative twist on a classic cold weather treat!! I can always go for a hot drink since I'm always cold too! This looks SO yummy and cozy! 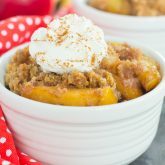 Just perfect for curling up by the fire and I love that you made it in the slow cooker! Thanks, Kelly! Hot drinks are the best on cold days! I'm the same way - I drink hot stuff all year round (always cold!!) but I love them even more when it's cold outside! This sounds so cozy and yay for the slow cooker! Love hot chocolate! This looks awesome! And the video - perfect! Pinned and shared ! So cozy and gooooood! My consumption of hot liquids has doubled recently too! I live on cold seltzer water all summer and then turn to tea and coffee at this time of year. :) Now I want THIS! Thanks for the kind words, Ashlyn! White hot chocolate is SO good! I love that you made this a white hot chocolate! Especially for messy people like me, so that when it spills on me all anyone will notice is how great I smell! Yum! Haha that's a good point, Shelby..love your thinking! Yep, I drink hot chocolate in the middle of July. What does it matter what the temperature is outside when you're in with the air conditioning, right? But it's been a long time since I've had white hot chocolate, and now I have serious cravings! This would be perfect as a treat on Thanksgiving! White hot chocolate is the best special treat! Thanks, Amanda! yup me too, I can drink hot chocolate even when it's super hot outside and right now it's super cold, so I will take 2 servings please! it sounds so good! I can never get enough hot chocolate in during the winter months. It's my favorite thing! Love this pumpkin caramel white chocolate version! It sounds wonderful!! I'm all about hot chocolate in the slow cooker, especialllllyy when it's WHITE hot chocolate! Flavored with pumpkin and caramel?! OMG, just so much deliciousness here I can't even take it. Need a big mug ASAP! It's the best flavor combo! Thanks, Rachel! Thanks for the hot chocolate love, Nadia! SO...this is the perfect fall and winter drink all in one. Pumpkin...check. White chocolate...check. Lazy girl approved? Double check :) Oh wait there is caramel too?? I am in heaven.